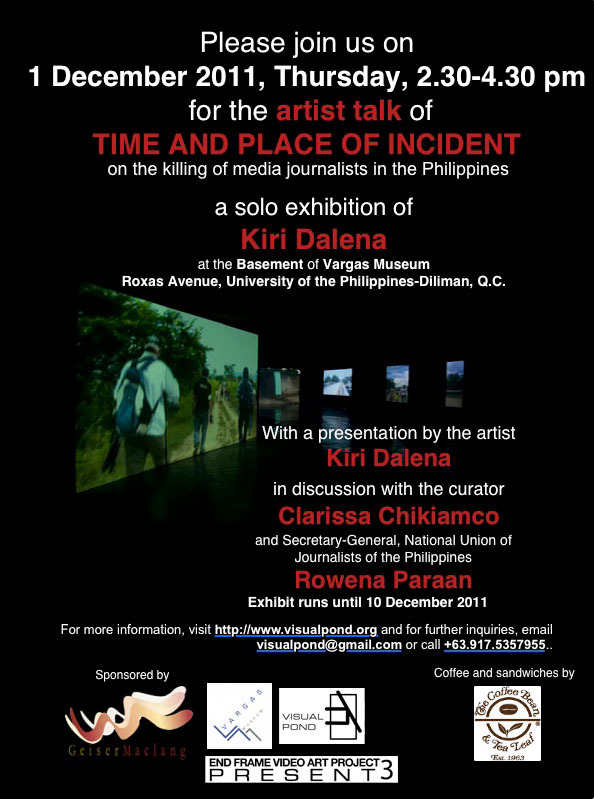 Please join us on 1 December 2011, Thursday, 2.30-4.30 pm, for the artist talk of TIME AND PLACE OF INCIDENT, the solo exhibition of Kiri Dalena at the Basement of Vargas Museum. The talk will include a presentation by Dalena in discussion with the curator, Clarissa Chikiamco, and Rowena Paraan, Secretary-General of the show's co-presentor, the National Union of Journalists of the Philippines. Dalena’s exhibition is also the fourth offering of End Frame Video Art Project 3, a project of the non-profit organization Visual Pond. Throughout the Philippine video art festival, artists stage a solo show presenting new video work in various venues from 2011 to 2012. For more information, visit http://www.visualpond.org and for further inquiries, email visualpond@gmail.com or call +63.917.5357955. The talk is sponsored by the GeiserMaclang marketing communication company with refreshments from Coffee Bean & Tea Leaf. The show is made possible by Visual Pond and Vargas Museum and the exhibition’s co-presenters: the National Union of Journalists of the Philippines, the University of the Philippines’ College of Mass Communications and Department of Art Studies, the Ateneo Art Gallery, GeiserMaclang and the individuals Carlo Gabuco and Gym Lumbera. Opening on 18 November 2011, Friday, 4 pm. Artist talk on 1 December 2011, Thursday, 2.30 pm. Exhibition runs until 10 December 2011. Visual Pond’s End Frame Video Art Project 3: Present, the 2011-2012 Philippine video art festival, together with Vargas Museum, presents Kiri Dalena’s solo exhibition, Time and Place of Incident. The show opens at the basement of Vargas Museum on 18 November 2011, Friday, at 4 pm and runs until 10 December. An artist talk will be held at 2:30 pm on 1 December, Thursday. Time and Place of Incident concentrates on the killings of media journalists in the Philippines, with the country being considered as the world’s most dangerous place for journalists after Iraq and Somalia. Dalena’s show involves documentation footage taken by her and volunteers at the grave sites of these journalists as well as shots showing selected places of their assassination. Believing video to be a powerful medium in conveying loss and injustice, the exhibition features Dalena’s stills and videos beaming through multiple projections in the given venue of the museum. A winner of the Ateneo Art Awards in 2009, Dalena works as an artist and documentary filmmaker. She has made a number of politically charged exhibitions and documentaries. Majority of her sculptures and installations address acts of state violence and injustice that continue to plague the Philippines despite several regime changes. She studied B.S. Human Ecology at the University of the Philippines Los Baños and learned filmmaking at the Mowelfund Film Institute. She had her first solo exhibition in 2007 at Mag:net while this Vargas Museum exhibition forms her fifth. Dalena’s Time and Place of Incident is also the fourth offering of End Frame Video Art Project 3, a project of the non-profit organization Visual Pond. Throughout the Philippine video art festival, artists stage a solo show presenting new video work in various venues from 2011 to 2012. Curated by Clarissa Chikiamco, the theme of the third edition, Present, refers to the current project’s focus on the video art practices of selected Philippine contemporary artists. Dalena’s exhibition follows the End Frame 3 shows of Tad Ermitaño, Manny Montelibano and Chitz Ramirez. End Frame 3 continues to 2012 with exhibitions of Kaloy Olavides, Maria Taniguchi and Yason Banal. 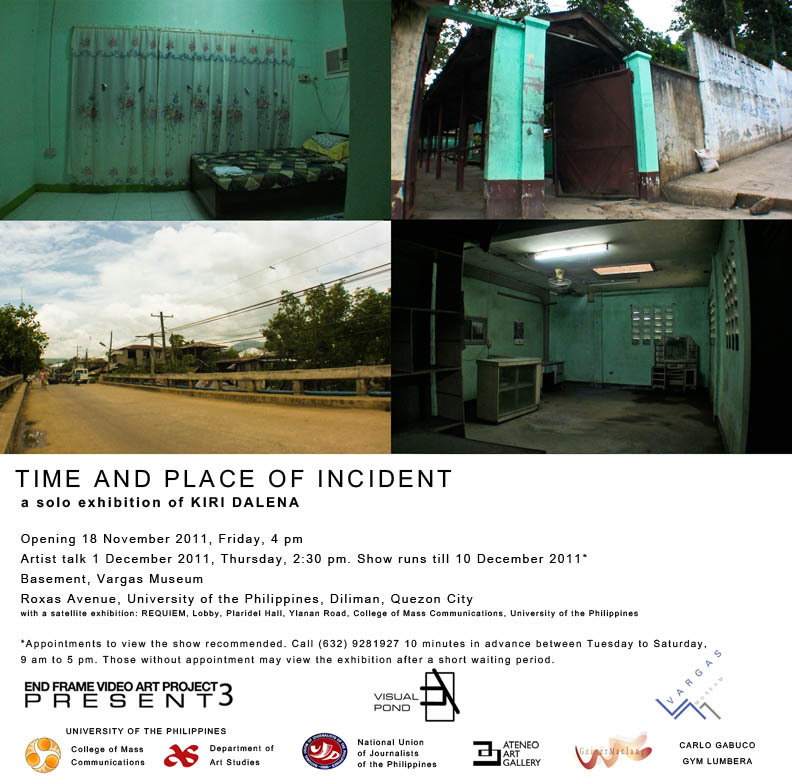 Time and Place of Incident is made possible by the exhibition’s co-presenters: the National Union of Journalists of the Philippines, the University of the Philippines’ College of Mass Communications and Department of Art Studies, the Geiser-Maclang marketing company, the Ateneo Art Gallery and the individuals Carlo Gabuco and Gym Lumbera. The show will be viewable throughout its run between Tuesday-Saturday, 9 am to 5 pm, (closed 30 November) with appointments of at least 10 minutes in advance highly recommended. The appointment may be set by calling Vargas Museum with telephone number (632) 9281927 or email a day in advance to vargasmuseum@gmail.com. Those without an appointment may view the show after a short waiting period. Vargas Museum is located on Roxas Avenue at the University of the Philippines, Diliman, Quezon City, http://www.vargasmuseum.wordpress.org. There will also be a satellite exhibition, Requiem, at the lobby of Plaridel Hall at the UP College of Mass Communications, Ylanan Road, Diliman, Quezon City, from 17 - 29 November 2011. For inquiries on Visual Pond projects and End Frame 3, visit http://www.visualpond.org or call Rica Estrada at +63917-8170198 or email visualpond@gmail.com.